^ Hatch, Louis Clinton (ed.) (1919). Maine: A History. American Historical Society. p. 53. http://books.google.com/books?id=EcUMAAAAYAAJ&pg=PA53 2011年7月24日閲覧。. ^ The Far Reaches of Empire: War in Nova Scotia 1710-1760. University of Oklahoma Press. 2008. ^ Northeast Archaelogical research Archived 2012年10月11日, at the Wayback Machine. ^ a b Wicken, 2002, p. 72. ^ Mi'kmaq Treaties on Trial, University of Toronto, 2002, p.73. ^ The history of the state of Maine: from its first discovery, A.D ..., Volume 2, by William Durkee Williamson. 1832. p.88, p.97. ^ Carr, James Revell (2008-10-14). Seeds of discontent: the deep roots of the American Revolution, 1650-1750. Bloomsbury Publishing USA. p. 134. ISBN 978-0-8027-1512-8. http://books.google.com/books?id=HRR_j-glWhMC&pg=PA134 2011年7月24日閲覧。. ^ Facts about the History of VERMONT*** Archived 2012年5月13日, at the Wayback Machine. ^ Faragher, John Mack, A Great and Noble Scheme. New York; W. W. Norton & Company, 2005, pp. 164-165. William Durkee Williamson. The history of the state of Maine: from its first discovery, A.D ..., Volume 2. 1832. John Grenier. The first way of war: American war making on the frontier, 1607-1814. 2003. 47-52. William Wicken. 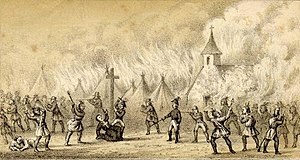 Mi'kmaq Treaties on Trial. University of Toronto Press. 2002. John Mack Faragher. A Great and Noble Scheme. New York; W. W. Norton & Company, 2005. William Wicken. "Mi'kmaq Decisions: Antoine Tecouenemac, the Conquest, and the Treaty of Utrecht". In John Reid et al. (eds). The Conquest of Acadia, 1710: Imperial, Colonial and Aboriginal Constructions. University of Toronto Press. 2004.